Please visit our fabulous sponsor this week, FabrikaFantasy, to see all of their wonderful products! 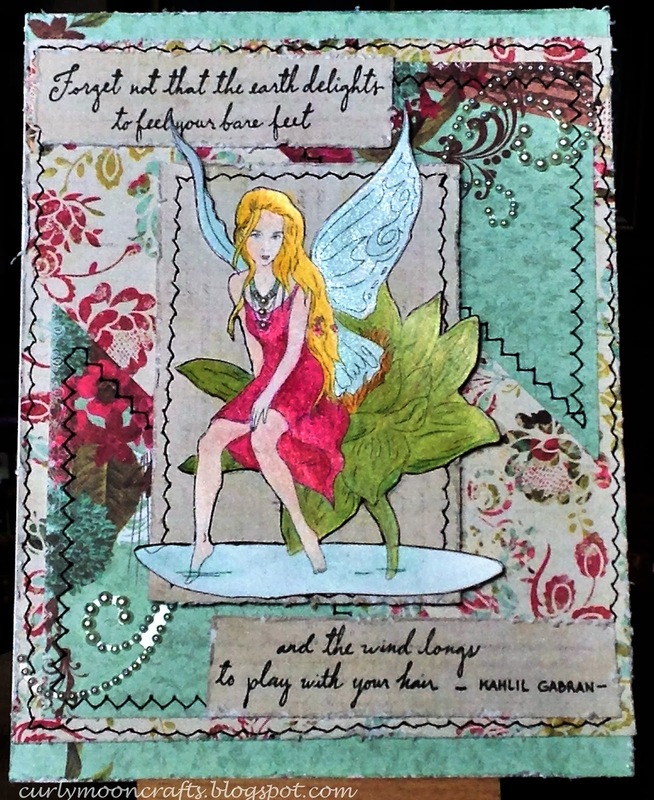 My creation for this week is a card using the fabulous Water Fairy digital stamp. I printed the image onto white cardstock and colored her with my Colour Blend pencils, blended with gamsol. I added some glitter brush pen to her wings, necklace, and dress. I distressed the edges of the paper and sewed the edges of the center and corner panels, then glued the background papers to my card base. I fussy cut the fairy and glued her to smaller panel and added it to the card using fun foam. I stamped the sentiment onto another paper from the paper pack using Memento Tuxedo Black ink - the stamp is a single stamp, so I masked the upper and lower portions so that I could make 2 separate panels. I finished with some gems on her necklace and the corners of the card. "Forget Not" stamp by Stampin' Up!